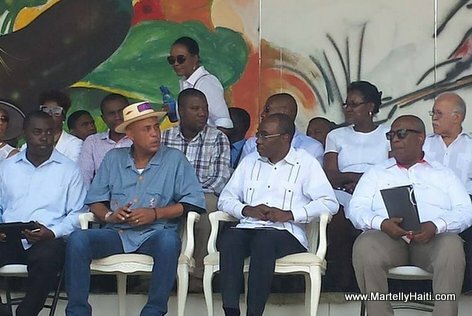 President Martelly ak ti chapo Haiti li nan tèt li... Kisa ou panse? May 1st is Labor Day in Haiti. Haiti should create jobs in every department in Agriculture, planting more mangos, avocados, lemons, bananas, pineapples, watermelons, sugarcane, cocoa, coffee, grapefruits, etc. to export to USA, Canada supermarkets. Haiti should create jobs in the furniture industry, making some nice dining rooms sets, bedrooms sets, living rooms sets to export to the USA, Canada. Haiti should build garment factories making some nice winter coats, spring coats, wedding dresses, jeans, men and women suits, draperies, linens, bedspreads, towels, etc. to export to the USA and Canada. Haiti should create jobs in the hospitality industry, building hotels, restaurants, dance nightclubs, taxis to develop tourism in Haiti. Haiti should develop education building one School of Medicine, Pharmacy, Dentistry in every department, one Law School in every department, One Architecture School in every department. Martelly five more years by the people. If the people are satisfied with Martelly performance, they will reelect him for five more years. This Is the best President off Haiti. C pap fasil pou nou genten yon prezidan konsa ankò,Sa pap fasil.